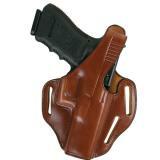 Pancake holsters are ideal for those looking for a conceal carry holster that sits close to the body. 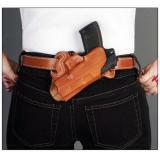 Typically sitting high on the hip, these pancake holsters allow you to conceal your firearm more easily making it possible to wear lighter clothing. 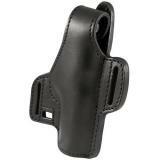 Available in leather and nylon models, our selection features pancake holsters from top brands like Galco, Safariland, DeSantis and several others. 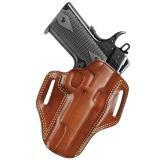 Pancake holsters are designed for discreet concealed carry with increased comfort, quicker accessibility and easier reholstering compared to inside-the-waistband styles. 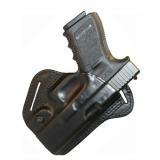 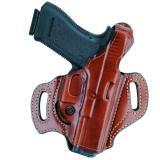 This makes them a popular choice for long-term wear for both law enforcement personnel and civilian firearm owners. 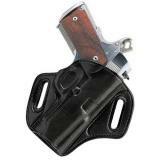 At CopsPlus, you will find pancake holsters for pistols and revolvers from high-quality holster manufacturers, including Bianchi, Safariland and Uncle Mikes. 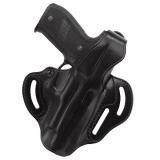 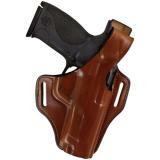 Pancake holsters are made from two wide pieces of material with the firearm held in between. 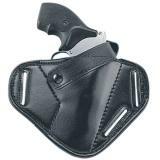 Their extended wings and wide-set belt slots allow you to pull the holster in tight to the body, preventing it from sagging outwards and minimizing its visibility underneath a shirt or jacket. 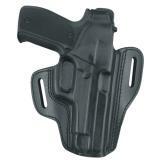 The smoother shape also helps to break up the silhouette of the firearm, making it more discreet even if it does print, and the larger inner surface molds comfortably against the hip. 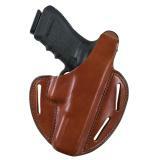 Pancake holsters typically ride high on the hip in a strongside position, making them easier to draw from while seated as well as improving concealability, but there are also pancake holsters for crossdraw carry and lower ride positions, as well as versatile models with extra belt slots that can be worn on either side. 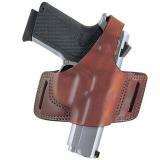 Most pancake designs are leather holsters, but they can also be made from tough synthetic materials like Kydex. 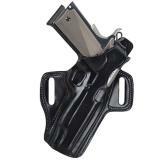 Many pancake holster designs are open-topped for easier access to your weapon, but some feature retention straps and other safety mechanisms for additional security. 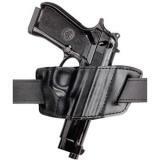 When choosing a pancake holster, it is important to consider how you plan to use it, particularly in tactical or duty applications. 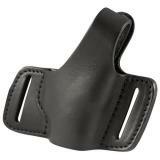 Our pancake holster selection features models at every price point, from tough budget-friendly styles to premium made-to-order designs. 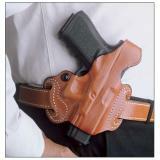 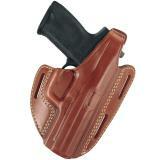 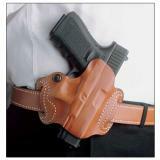 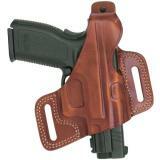 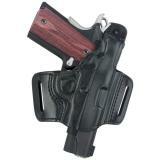 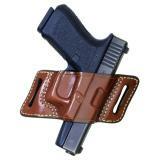 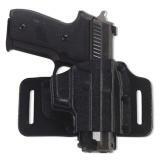 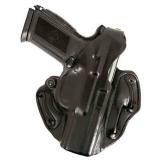 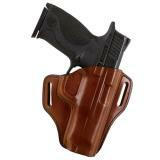 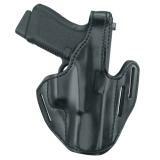 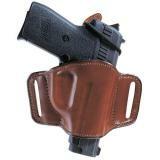 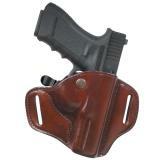 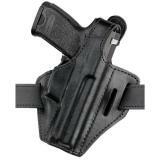 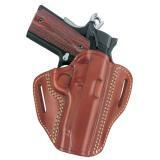 You will find a wide range of holsters from brands including Blackhawk, Galco, Boston Leather and more.